Well, if you wanted evidence as to how little this country values black lives, look no further than Tulsa, Okla., where a white former reserve deputy (aka a wannabe cop) walked out of prison, scot-free, after serving less than half of his already meager four-year sentence for killing an unarmed black man. Robert Bates, 76, was released from North Fork Correction Center in Sayre, Okla., on Thursday morning after serving 497 days. That’s a little more than 16 months for killing Eric Harris. Bates is expected to serve probation for the remainder of his sentence, according to the Associated Press. Oklahoma Department of Corrections spokesperson Matt Elliot said that Bates earned earlier release through good behavior, not because his case was given precedence over others. Meanwhile, the family members of Harris can only hope that Bates’ release will bring new life to their federal civil rights lawsuit that claims the Tulsa County volunteer deputy was improperly trained and supervised, and that the sheriff at the time turned a blind eye to what was going on, resulting in their loss. “Now that Mr. Bates is out of prison, it is our expectation that the civil rights suit filed against him and former Sheriff [Stanley] Glanz will finally begin to intensify,” the family said in a statement through attorneys. Bates was convicted of second-degree manslaughter in the April 2015 shooting death of Harris, 44. Bates, who was 74 at the time, claimed that he was reaching for his Taser during an undercover sting operation, but he “accidentally” grabbed his gun, fatally shooting Harris, who was attempting to flee the scene. Glanz, for his part, resigned after being indicted by a grand jury and was sentenced to a one-year suspended term on misdemeanor charges. 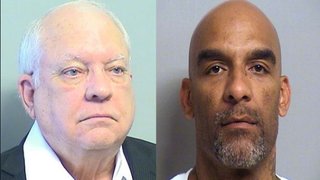 According to AP, Laurie Phillips, the attorney for We the People Oklahoma, a grass-roots organization that launched a petition ultimately leading to the grand jury investigation of Harris’ death, hopes that the lawsuit, which seeks financial damages for Harris’ death, will force the Tulsa County Sheriff’s Office to change the way it operates and trains its reserve deputies.